Burton Baton is a mix of an English old ale and an imperial IPA and then aged in oak barrels. Needless to say, this blend of styles is a first for me. It pours a dark orange/amber with a relatively clear body. Got a one finger white head. I definitely get a lot of the old ale characteristics on the aroma as dark fruits are up front. The oak barrel is subtle, but resinous, piny hops make themselves known. The taste yields not only the dark fruits and pine, but the oak is stronger and with it comes some caramel and vanilla. It's somewhat syrupy in the mouthfeel and the finish is pretty bitter, but not a turn-off. 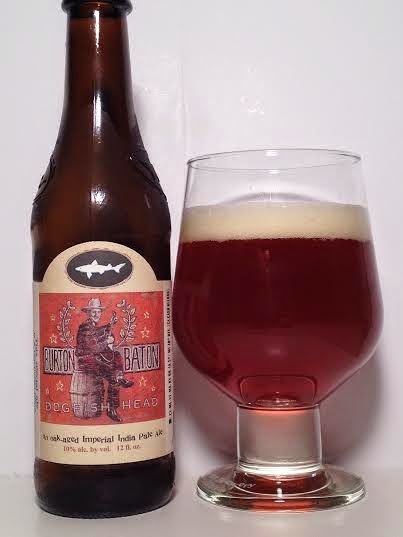 Dogfish Head is known for some unusual brews and Burton Baton falls into that category. I wouldn't rave about it to friends, but my indifference is not based on the fact that it is poorly made, because it isn't. It is most definitely an acquired taste. The old ale characteristics are dominant, so those who like that style will enjoy this beer. Personally, I just didn't find the combination of the two vastly different styles of beer to be something I would go back to.